The Commerce & Industry Minister, Nirmala Sitharaman willing to bring startups of SAARC (South Asian Association for Regional Cooperation) countries at a common platform, where startups of the South Asian region can exchange their ideas which can be mutually beneficial. "I will be working towards having a SAARC (South Asian Association for Regional Cooperation) country meet for startups here. We are looking at organising a SAARC countries' meet for startups, where mutually beneficial ideas for innovation can be worked out," Sitharaman said in New Delhi on Monday. She said, "The inter-relationships and synergies can be worked out better because South Asian minds have similar thinking." She also asked participants and organizers of the event to share their ideas about this people-to-people meet. "If the ministry would get feedback and suggestions in the next couple of months, by December we can meet in which SAARC country startups can come to India and share ideas," she added. The minister was speaking at the launch of the Startup India Virtual Hub, an online platform for all stakeholders of the entrepreneurial ecosystem in India to discover, connect and engage with each other. 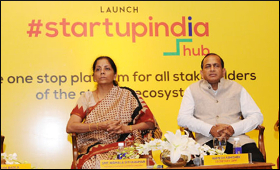 Speaking about the need to bring the entire ecosystem together on one platform, Sitharaman mentioned that Startup India Virtual Hub is an effort to create a marketplace where all the stakeholders can interact, exchange knowledge, and enable each other to grow. It will streamline the lifecycle of existing and potential startups, helping them access the right resources at the right time. She also encouraged all entrepreneurs in India to utilize this portal and all enabling stakeholders to contribute to the platform as much as possible. The Minister also announced a new initiative, wherein a Startup exchange program amongst the SAARC nations would be organized. The Virtual Hub is a dynamic & interactive platform that will facilitate learning & development, networking, mentorship, funding,etc. for startups. The basic principle behind developing this platform is to aggregate different offerings of theecosystem and enable discovery by the right audience. Startup India Hub has partnered with various organizations to on-board entrepreneurs & investors, as well as build knowledge modules. To ensure accessibility across various platforms, dedicated Apps are also available on both Android and iOS. India is the third largest startup ecosystem around the globe, with 3-4 startups commencing every day. The Hub will act as a nodal platform and will enable users to connect with ecosystem stakeholders, access free learning resources, tools & templates on legal, HR, accounting & regulatory issues and discussion forums. The Hub has also aggregated over 50 relevant Govt schemes/programs. In the next phase, the platform will also aggregate schemes available across various state governments. To provide a better user experience, the platform has been enabled to build smart intelligence along with Chatbots to automatically collate, update information and respond to queries. The launch event of the Hub was kick-started by a panel discussion on 'Navigating the Startup Landscape' earlier in the day.